I used A4 white card horizontal fold then embossed with Grand Impressabilities "Butterfly Garden"
Then placed over a piece of dark purple card and then used my Grand Labels 4 No. 5 die for the lighter purple shape. 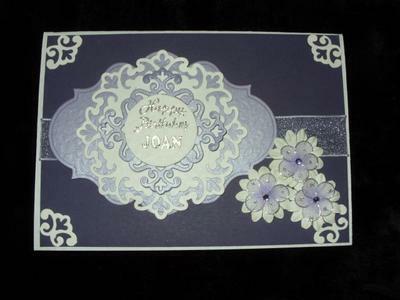 Next came a white Parisian Motif from Spellbinders, and the next 2 shapes were from Parisian Accents in light purple. I posted it yesterday so my friend has not received it as yet. I am sure that when she sees this very beautiful card she will be delighted with it... and will appreciate the hard work and love that has gone in to it's creation. How I love the look of Spellbinders they are such a good investment for any card maker. beautiful card.love the parisian dies.